Adipose-derived mesenchymal stromal cells (Ad-MSCs) are a promising tool for advanced cell-based therapies. They are routinely obtained enzymatically from fat lipoaspirate (LP) as SVF, and may undergo prolongedex vivoexpansion, with significant senescence and decline in multipotency. Besides, these techniques have complex regulatory issues, thus incurring in the compelling requirements of GMP guidelines. Hence, availability of a minimally manipulated, autologous adipose tissue would have remarkable biomedical and clinical relevance. For this reason, a new device, named Lipogems® (LG), has been developed. This ready-to-use adipose tissue cell derivate has been shown to havein vivoefficacy upon transplantation for ischemic and inflammatory diseases. To broaden our knowledge, we here investigated the angiogenic and anti-inflammatory properties of LG and its derived MSC (LG-MSCs) population. 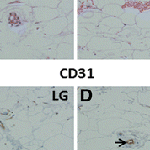 Human LG samples and their LG-MSCs were analyzed by immunohistochemistry for pericyte, endothelial and mesenchymal stromal cell marker expression. Angiogenesis was investigated testing the conditioned media (CM) of LG (LG-CM) and LG-MSCs (LG-MSCs-CM) on cultured endothelial cells (HUVECs), evaluating proliferation, cord formation, and the expression of the adhesion molecules (AM) VCAM-1 and ICAM-1. The macrophage cell line U937 was used to evaluate the anti-inflammatory properties, such as migration, adhesion on HUVECs, and release of RANTES and MCP-1. Our results indicate that LG contained a very high number of mesenchymal cells expressing NG2 and CD146 (both pericyte markers) together with an abundant microvascular endothelial cell (mEC) population. Substantially, both LG-CM and LG-MSC-CM increased cord formation, inhibited endothelial ICAM-1 and VCAM-1 expression following TNFα stimulation, and slightly improved HUVEC proliferation. The addition of LG-CM and LG-MSC-CM strongly inhibited U937 migration upon stimulation with the chemokine MCP-1, reduced their adhesion on HUVECs and significantly suppressed the release of RANTES and MCP-1. Our data indicate that LG micro-fragmented adipose tissue retains either per se, or in its embedded MSCs content, the capacity to induce vascular stabilization and to inhibit several macrophage functions involved in inflammation.